Roasted butternut and acorn squash, parsnips and turnips have particular appeal at this time of year. These healthy and naturally gluten-free vegetables show up in a colorful and filling winter salad. Preheat the oven to 425° F. Place the vegetables on a large cookie sheet, drizzle with 1 tablespoon of olive oil, and season with salt and pepper. Bake vegetables until tender and beginning to caramelize, 35-40 minutes, turning once. Add 3 teaspoons of olive oil to a large pan and place over medium heat. Add the bread and a pinch of salt and pepper. Cook bread until crispy on the outside, 10-15 minutes. Put the vinaigrette ingredients into a large bowl. 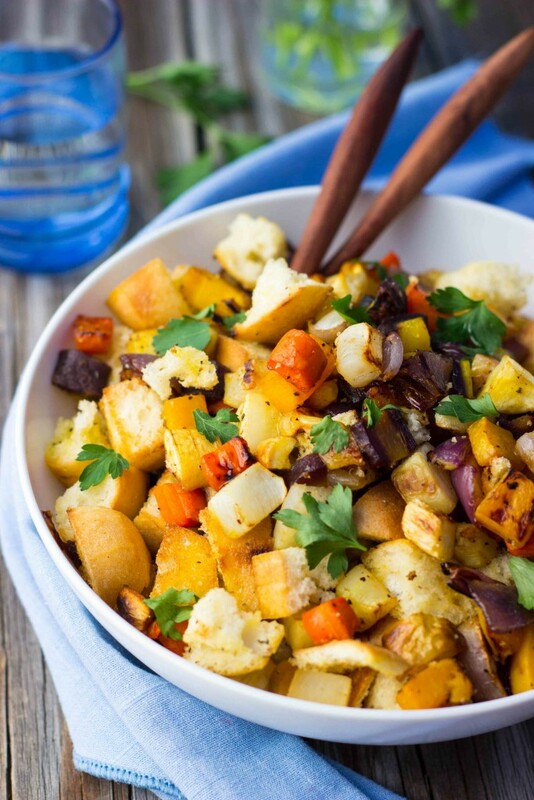 Whisk until combined and then add roasted vegetables, toasted bread and fresh parsley. Stir until all ingredients are combined. Serve warm or cold. Recipe by Isadora Lassance. Lassance lives in Tucson, Arizona, with her husband and their orange cat, Cheeto. She blogs shelikesfood.com, a mostly gluten-free food blog that celebrates whole food and seasonal ingredients. Nutrition analysis: 600 cal, 43 g fat, 0 mg chol, 1010 mg sodium, 53 g carbs, 8 g fiber, 15 g sugar, 4 g protein.